Well, another few weeks has gone by and I haven’t posted anything. This hasn’t been due to a lack of ideas, or even a lack of events in my own life on which I could write. Instead, I think a lot of it come from sloth. Sloth and getting out of the habit of writing, anyway. You see, I’m a stay-at-home dad for the time being. And most of the time I love it. I love getting to cuddle with my boys and watch them grow. They’d probably love it better if skills went beyond bread and jam, bread and eggs, or bread, ham, and cheese. But still, with two 18 month-olds running around, getting extra work done can be difficult. Sadly, this isn’t because I’m too busy chasing after them, not most of the time anyway, but because it’s too easy to just sit and watch TV or sit and read. These would be OK, the latter at least, if when they went down for their naps I exercised or wrote or something. But so often I don’t. Writing while they’re awake has its own problems too. Little fingers like touching computers and when they don’t, the little mouths attached to them start crying. But still these are just excuses. I could probably find a way to work around this, to train my kids not to grab at my computer while I’m working and still spend time with them. So what’s the problem? Getting out of the habit. As many of you know, since I wrote to you about it, I’m publishing a novel (or Faërie Romance as I like to call it) with Wipf and Stock Publishers. What you might not know is that I wrote that book while also blogging and working on my PhD thesis (which is also being published by Fortress Press). Just on my thesis and novel alone, not counting conference papers or blog posts or letters or journal entries, in the three years I was resident in Nottingham I wrote over 150000 words or close to 400-500 pages. Add in everything else and I probably hit thousands of pages (not all of it good, admittedly). You see, for me at least, and I think for most writers, writing begets more writing. I had a routine of writing in a few different journals, reading books for research, pleasure, and enrichment, writing letters to friends, blog posts, my thesis and more. All of these outlets for writing made me want to write more. So, once I finished my novel, and then my thesis, and stay-at-home parenting took over more and more of my time, I started writing in the other places less and less. Hence my relative silence here. Once I stopped writing in some areas, it became harder to write in others. Virtue and vice have firm roots in habit. Vices are bad habits we engage in, they become second nature to us, so much so that often we don’t even recognise temptation or the choice to give in. There is only one way to rid ourselves of vices (with the aid of God’s grace), and that is to replace them with their corresponding virtues. These virtues must become habits replacing the vicious habits. I mention virtues and vices because their inherent relationship to habit has been precisely my problem. Vices like sloth (and others I won’t mention here) have gotten in the way. I have not simply gotten out of good habits (though some might contend that my writing here is not one) but have fallen into bad ones. That needs to change. I must pursue the virtuous life. For only then can I co-operate with the grace of God and work toward my deification. This might sound strange, writing for a blog doesn’t necessarily lead one to deification. But writing for me is part of that process and the only way I can get back into the habit of writing is to write, to replace sloth with diligence. So, I am committing myself to write in my journal every day; to write letters when I have some to write; to post here twice a week; and to begin work on a new research project; all while I work on preparing my two works for publication. So, I have a request for you my correspondents, please help keep me accountable (a word with which I have some hang-ups). Feel free to ask me about my writing habits, clamor for new content out loud––I know you keep it bottled up, let it out. Being a father should not keep me from caring for my children and fulfilling my vocation of being a theologian, help me make sure it doesn’t. Give me advice, tell me about your own struggles, ask me to write about something, do anything you think might help me keep writing. I’ll let you know what works and what doesn’t. In the meantime, look out for two new posts next week. I apologize for my lack of communication over the past month. I’ve had to submit my thesis corrections (I’m still waiting to hear back on the results), and I’ve had some other life things come up. But enough with excuses! I will endeavor to return to a regular posting schedule of at least twice a week. Lately at the church my wife and I attend many of the sermons have had a very focused attention on evangelism. This isn’t something unique to the church we currently attend. I think I can safely say that with one or two exceptions every church I have attended has had a profound emphasis on evangelism, that is telling people who don’t believe in Jesus about Jesus in order to bring them into the fold of belief in Jesus. Some churches even go so far as to suggest that evangelism is the primary thing Christians are meant to be doing. Now I want to be clear, I am not against evangelism. Of course part of being a Christian is to “make disciples of the nations.” But I want to challenge the idea that this is the primary thing Christians are called to do. We often call this passage The Great Commission, but it should be remembered that it only exists in Matthew’s Gospel and Mark’s (though many scholars believe the Great Commission portion of Mark’s Gospel is a later addition). Luke’s Gospel does not include any kind of commissioning other than to wait in Jerusalem until they clothed with power from on high and John’s Gospel ends with Christ’s commands to Peter to feed his sheep and follow him. Acts does begin with Christ calling on the 120 disciples to be his witnesses in Jerusalem, Judea, Samaria, and the ends of the world. So we have this odd mix of Gospels ending, and Acts beginning, with some calling on the disciples, and therefore us, to be witnesses to the reality of God Incarnate, of God Crucified, of God Resurrected, and of God’s Return. So this is clearly important, but it is to be the central focus for Christians, the primary thing we’re meant to dedicate our lives to? It seems to me that the rest of the New Testament does not bear that out. First, we should keep in mind that even the Matthew passage part of what the disciples are called on to do is teach “them to observe all that I have commanded you.” I don’t think this limited to making disciples, but all the commands Jesus has given, including, “be perfect as your heavenly Father is perfect.” Which brings me to what I think is central: deification. For those who have kept up with the topic of my PhD thesis, you’ll know that I worked on the subject of deification and human creativity. Deification means being so unified to the Triune God through Christ and the Spirit that we may be called gods (although that by adoption/grace and not by nature). We could, to a certain extent, also call this holiness or even perfection. This is the thing to which we have been called and the reason for which we have been created, to be united to the Divine Life. Paul’s letters bear this out. When you read through them you see that Paul spends little to no time about how believers should go about converting unbelievers, about how we should evangelize (although he does spend time concerning his own efforts in spreading the Gospel). Rather he spends most of his time concerned with our individual corporate holiness: how we conduct ourselves as individual Christians and as the Church. Paul calls us to strive towards the goal, which isn’t to evangelize as many people as we possibly can, but to come into that deified life in Christ. It is for this reason that the early and medieval Church spends so much time on topics like contemplation, which in essence means times of intense thinking about and entering into the presence of God. This is the foundation of the Christian life, entering into the divine life through the incarnation of the Son and the indwelling of the Spirit. It is from this place of working toward our deification, which can only be done in and with the grace of God, that all other aspects of Christianity flow: like evangelism, social justice, human creativity, and more. The Christ event transfigures how we see the world around us and forces us to begin by doing more than simply assenting to a relationship with Christ, but to actually begin (or more rightly continue) the deifying process which is first and foremost about our transfiguration into Christ by being adopted into his Sonship. The natural outflow of this will include concern for the non-believer and for the poor and oppressed. You see, I’m concerned. I’m concerned about the churches who make evangelism the main point of being a Christian. I’m concerned that making evangelism the central point of Christianity will lead to shallow Christians. I’m concerned it will lead to Christians who are like the seeds sown on the rocky soil, they will accept the Gospel with eagerness but will be burnt by the sun because they lack roots. It is of course true that there are problems with focusing only on personal or even corporate holiness (especially when done so without love and mercy) or only on the social or creative aspects of Christianity. However, I think the foundation must be in deification, in holiness. We must found ourselves in the reason God created us in the first place, namely to be joined to him in love. God did not create humanity to evangelize (since that require people created who needed evangelization). Neither did he create us to right the wrongs in society (since that would require societies existing in sinfulness before sin entered the world). God created humanity to be joined to him first and foremost, everything else we do is intended to facilitate that end. So I’m not calling us to stop evangelizing, far from it. What I am calling us to is a return to a foundational emphasis on the end for which we were created so that we may participate with God in bringing about our own salvation and deification and in order to transform this world to bring it into a deifying relationship with God. But we must start with our personal and corporate holiness, that must be our base of operations from which we go out to transform the world. Several things have aligned in my life to bring me to this letter. The first is my annual re-read of C. S. Lewis’s Cosmic Trilogy (Out of the Silent Planet, Perelandra, and That Hideous Strength). I’m currently in the beginning of Perelandra. The second is what re-reading this always leads me to, this interview with John Milbank, here’s a textual reproduction of the most important part. The third was this post, “Have We Made Satan too Powerful” by my friend Adam Tomlinson. Since I’ve written on the others before, I’ll give a quick summary of Adam’s post. Adam, rightfully, reminds us that Satan is not as powerful as God. In short, he reminds us that we are not gnostics. We don’t believe in co-eternal and co-powerful gods of good and evil. Therefore, when we act like Satan is directly attacking us, or our church, or our small group we may very well be giving him too much power, namely omnipresence since others are saying the exact same thing in completely different parts of the world at the same time. Nevertheless, as Adam admits, just because it isn’t Satan himself does not mean that it isn’t one of his followers (whether human or demonic). What I have often found, however, is that while many Christians, especially in the West (and particularly in Protestant churches, though Catholics and Orthodox can be confused on this as well), is that while we’ll readily admit the existence of Satan and the demons, angels aren’t something we particularly believe in or even think about. Now I’ve written to you about angels before, but there’s one thing I want to make perfectly clear. Angels and demons are created beings. It’s easy to forget that they are created since they are so different from us in some obvious ways. They don’t have bodies, or at least don’t have bodies like ours. While they can take shape, as Scripture makes very clear, they don’t seem to be corporeal in the way things we’re used to interacting with are. They aren’t like rocks or trees or animals, we don’t often see them (although that’s likely a problem with our sight) or sense them in any physical way. Yet I can say unequivocally that there is at least one angel with me now as I write this though I am not sensibly aware (as in I cannot see, hear, touch, taste, or smell it) of its presence. But it is here nonetheless. What is more, that they are created means that they, like us (and everything else that exists), belong to the created order. What this means, in other words, is that angels belong to and exist in the created cosmos. Now, I don’t mean the universe when I say cosmos, at least not how we normally understand it. They aren’t in “space” (a rather inappropriate name for the beauty that lies beyond our atmosphere). They aren’t on some other planet or in some other solar system. Rather they are part of created existence itself. Therefore they, and their abode, namely heaven, are part of our cosmos and their reality, which is many ways more real than our own, often intersects with ours. It is for the reunification of their realm and ours that we look forward to. Supposedly (I’ve studied this somewhat and have found no ancient or medieval evidence of this), the ancient Irish and Welsh Christians believed in “thin” places, places where the boundary between heaven and earth is thinner than in others. I used to be rather infatuated with this idea. Now, however, I think thick is a better adjective. There are places in our world that thicker than others because our reality is filled with a greater reality, although a created one, nonetheless. So, why is all this important? For this reason, if angels and demons belong to our cosmos, if they can and do interact with us, then we need to be aware of that and we need theologies that give proper space to these beings. According to the Scriptures (insofar as we can take these numbers literally) for every demon out there two more angels exist. This means that whenever we think about demons working to foil the plans of God’s kingdom and God’s people, there are more angels working, in one way or another, toward the consummation of God’s plan for all of reality. The angels are also waiting for our deification. Theologians like Gregory of Nazianzus, Gregory of Nyssa, and Maximus the Confessor describe human beings as microcosms. In us comes together the material, the vegetable, the animal, and the rational. While the first three categories cover pretty much all created things that we typically experience here on earth the fourth is, along with a reference to God himself, a reference to the angels who are pure intelligences. This means there is something of rocks, trees, dogs, and angels in us. Christ infused into that nature the divine as well. 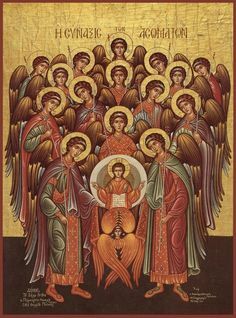 Therefore, just as all lower creation awaits with longing the coming of the sons of God (deified humanity), so too does the higher creation, the angels and archangels and cherubim and seraphim. Their fate is tied to ours. And let’s not forget that Scriptures tell us “that we will judge angels?” (I Cor 6.3), which is presumably a reference to demons. Therefore we need more than a theology with only a mind of the terrestrial, we need a celestial theology as well. This is what people like John the Theologian, Dionysius the Areopagite, Maximus, and Thomas Aquinas, and all Christian mystics are constantly trying to tell us. We should really start listening. Well, I’ve done it. 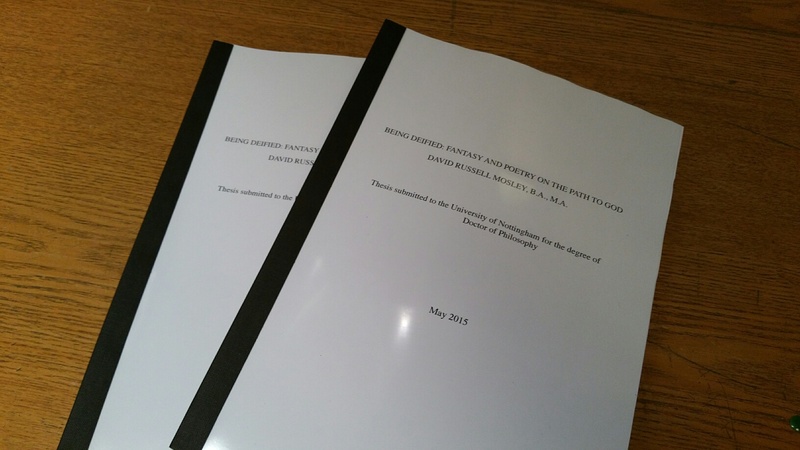 I’ve finally submitted my thesis, titled: Being Deified: Poetry and Fantasy on the Path to God. It’s gone off to my examiners who will read it and then I will have to go back to the UK to defend it on 20 July. I can’t believe I’m almost done. Whatever happens at my viva, I will be done with my PhD within the next 12 months. I can’t believe it, I really cannot. In honour of my finished thesis, I thought I would put up my old posts on writing this beast. It’s gone through many iterations, permutations, and transfigurations, but now, it’s almost done.